1. I went to watch a midnight movie last Saturday, IP Man2. The movie was great and i had a great quality time with my brother. 2. I didnt drop more than 10 ECs last week . I felt that it wasnt fair to all my EC droppers since my last entry was in Bahasa Malaysia. 3. I came across blogs with motivational contents on life. That was refreshing. 4. I did take my time to walk around my office area. 5. I made new online friends. 6. I did attend a small spontaneous surprise party made by my students. The occasion? 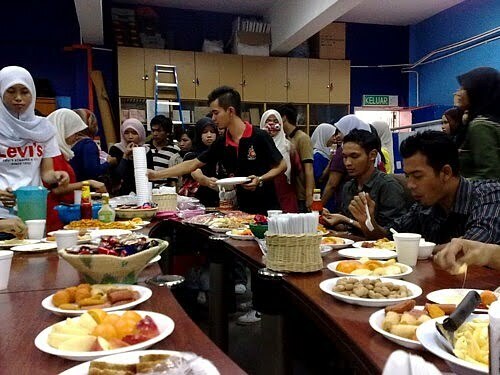 Teacher's Day : D Thank You my students. Anyway, i believe that when life is somewhat static, try to do things out of your routine. That will spice and freshen up your life. Oh! while i am doing things out of routine, i am doing a RestNrilekS blogging community as a reward to my readers. The idea came after seeing Kak Jie's on her WP platform. Nothing fancy that is. Just a space on my right column where you can have your latest entry displayed. It is still on beta mode ( I am not sure how this will go). What is a RestNrilekS Blogging Community? It is links of frequent online blogging friends of RestNrilekS. Only 7 links will be shown at a time so that everybody will have fair chances of being listed. However, you need to fill up a form on the "Kontact" by leaving title of your latest entry on "Subject" and latest html entry on "Message." I will manually list them. And please bear with me if your link is somewhat late being listed. The links will stay there, at most for 2 days, unless no one is submitting his/her latest entry. Owner of more than one blog may have to wait before submitting another blog of his / hers too, unless no one is submitting too hehee. 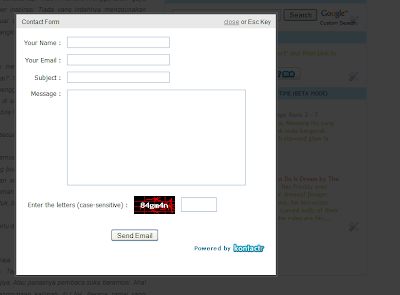 Here is a sample of pop-out form after clicking that "kontact" button. Beta Mode? Why? You see, i am still having problem as shown below. Denaihati link is still showing that last submitted entry, but Mon's link however is updating itself. Instead of showing that one particular entry, it is showing an automated updated new entry. 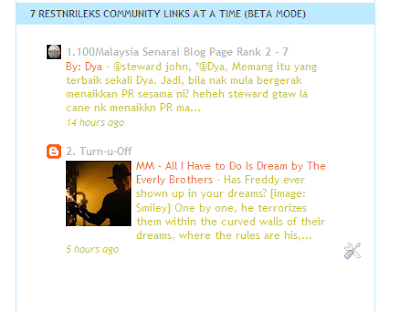 Worse comes to worse, i ll just show here 7 blog links of RestNrilekS readers. I might cancel the idea too if no one is submiting his / her latest entry. Heheee. So, who are qualified to submit? Right now, it is open to readers who have submitted comments at least for three posts (Otherwise people might spam that form - aha). Then, those twitbloggers who frequent retweet my post. Dont get me wrong as if i am trying to build exclusive online friends. No, this is only small act of rewarding my beloved and precious readers. Hopefully, you ll find links displayed there beneficial to your blog. That is all for now. Happy Blogging and have a great day everyday.